Ukraine has reinstated military conscription to deal with deteriorating security in the east of the country, acting President Oleksandr Turchynov. The move, announced in a decree, came as pro-Russia militants seized the regional prosecutor’s office in the eastern city of Donetsk. Ukraine blames Russia for organizing the seizures of a number of offices in the east, a claim Moscow denies. Oleksandr Turchynov admitted on Wednesday that his forces were “helpless” to quell the unrest in some parts of the east, saying the goal was now to prevent it from spreading. He also said Ukraine was on “full combat alert”, amid fears that Russian troops could invade. On Thursday, his office said in a statement that conscription was being introduced “given the deteriorating situation in the east and the south… the rising force of armed pro-Russian units and the taking of public administration buildings… which threaten territorial integrity”. Kiev’s decision is, in the short-term at least, a symbolic step as the Ukrainian military has been starved of cash for years and is no match for what Russia has on its borders. The real battle for control of Ukrainian territory is already under way and Kiev is losing ground. 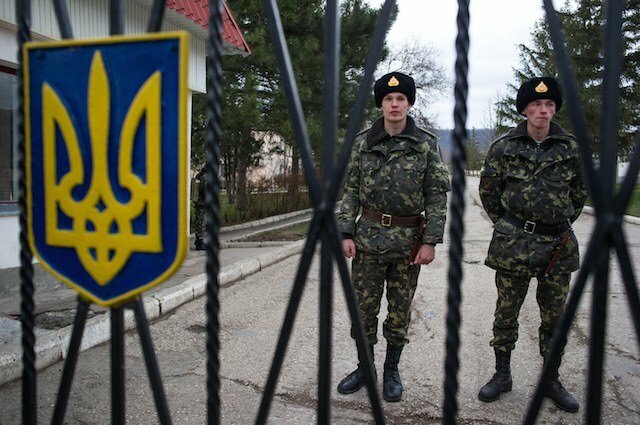 Analysts say Ukraine has 130,000 personnel in its armed forces that could be boosted to about one million with reservists. Kiev scrapped compulsory military service for young men in late 2013 under a law introduced by then President Viktor Yanukovych. At the time, Viktor Yanukovych said Ukraine would introduce military reforms to create “a professional army”. In Donetsk on Thursday, pro-Russian militants attacked the prosecutor’s office, accusing those inside of siding with the government in Kiev. The crowd later forced its way into the building, stripping weapons and shields from police officers and raising the flag of the self-proclaimed Donetsk People’s Republic. Donetsk, an industrial hub of more than one million people, has seen a number of government offices seized in recent weeks. Eastern Ukraine has a large Russian-speaking population and was a stronghold for Viktor Yanukovych before he was overthrown by protesters in February. Russia then annexed the Crimean peninsula – part of Ukraine but with a Russian-speaking majority – in a move that provoked international outrage. The crisis has plunged East-West relations to their lowest point since the Cold War. On Thursday, German Chancellor Angela Merkel asked Russia in a phone call to President Vladimir Putin to help free foreign monitors held in eastern Ukraine. The military observers were seized by pro-Russia separatists at a checkpoint in the flashpoint town of Sloviansk last Friday. For his part, Vladimir Putin reiterated his call for Kiev to withdraw troops from the south-east to open the way for a national dialogue.